Best Commercial security in Houston is an essential element to consider in any proper business planning in the big city. Commercial security customers have different needs, from surveillance and accessibility to security and monitoring. At the same time, safety and efficiency are at the core of any security system consideration. One of the main elements a company may worry about is access control, whether for employees or customers. It is important to consider each area of your business and determine how much accessibility should be allowed. For the Best Commercial security in Houston, Some areas may require highly controlled and limited access. While others stay open to the public and only need special access control after business hours. You may want to keep in mind whether you’ll track each person in your business, or maybe special personnel who have access to restricted areas. In today’s market, there are many options to choose from for security access control, from key cards to access codes to scanners. 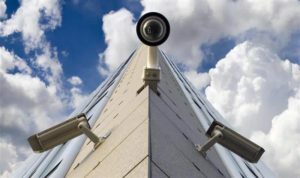 Surveillance is another important aspect of Houston’s commercial security systems. Whether large office building, warehouse or stand-alone office, the surveillance requirements differ but need for surveillance is always there. When you have clear visible CCTV/Video surveillance cameras in and around your business it portrays a business owner who takes his business security very seriously and may thwart unwanted criminal activities. Properly installed surveillance cameras in strategic areas allow your business to flourish by keeping your employees and customers safe. Protecting your assets and allowing you or security personnel to assess internal or external threats to safety and profitability. Security monitoring has so many options for maximizing the efficiency and safety of your commercial property. For security, you can set up your app to receive alerts for any breach of security or any unusual activity. Energy efficiency, you can set and control your thermostats and lights remotely as well as be alerted when certain safety breaches may impact your energy efficiency, like a window being left open allowing the hot air in and causing the A/C to go on. For safety, the carbon monoxide, fire and water sensors may protect you from a serious health and profitability catastrophe. Video Monitoring with easy playback features lets you quickly search for any moment in time that’s been recorded, for checking up on customer or employees disputes or for information needed to provide law personnel for criminal activity. You’ll then have peace of mind knowing you took all proper precautions to prevent any loss or unsavory activity. Also that you have implemented systems to keep you informed and to maximize your company’s profitability is priceless. Probably one of the best innovations in business and home security is remote accessibility. Everything is done, all features your system includes are accessable easily anywhere you are. You can access your video storage, check if windows or doors have been left open, watch your kids or employees as they work. Adjust your temperature, and get alerts for water leaks, and adjust your lights as needed etc. On any computer, phone or tablet. It’s both remotely accessible and remotely controlled. All your features come with the possibility to be controlled via the remote access app. You can unlock, lock or close your door as needed. 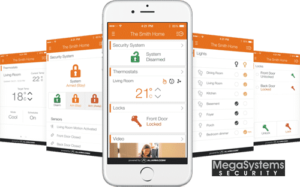 You’ll get alerts for things you set up, like extreme temperatures, water leaks, lights staying on or doors left open. You can adjust your lights, temperatures and other security allowance feature from your app no matter your location. It can also help you appear as if you’re home even when you aren’t to dissuade unwanted intruders. Call us if you’re interested in adding any of the features in this article to your current system. If you’re looking for a new security system in Houston or the surrounding areas. (Tanglewood, Galleria, Heights, Saddlewood, Memorial Villages, Memorial Park and many more!). 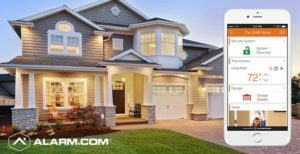 Visit our security systems promotion page to turn your alarm system into a smart security system this summer for fraction of the cost! The cost of a DIY system is one large upfront fee. Usually, a system that comes with different components for the typical user. You’ll need to buy any extra parts specific to your needs. When you hire a security system company you pay a one-time installation fee which covers all components of your system and then a small monthly fee.